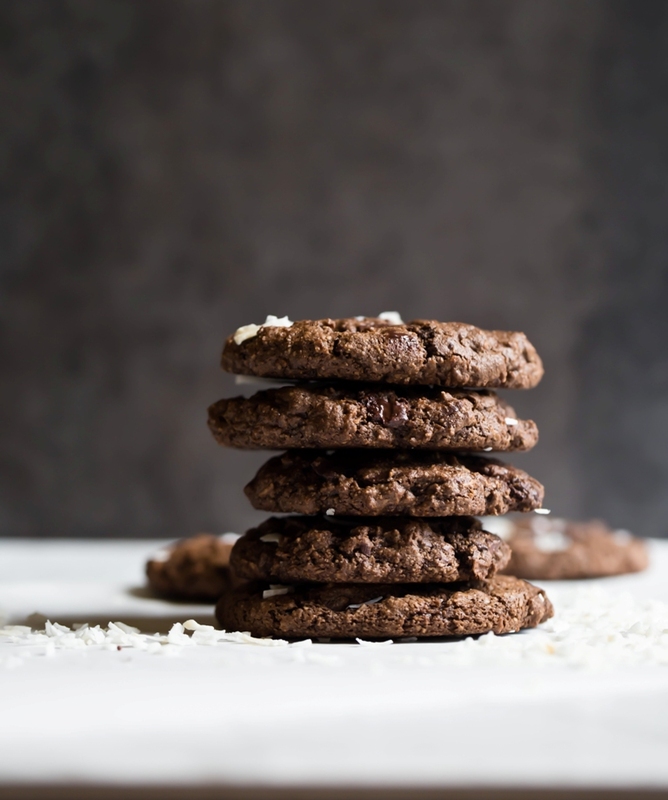 These Grain-Free Chocolate Coconut Cookies are vegan, 1 bowl, 8 ingredients and everything you want in a cookie. Crispy edges, fudgy and chewy center and the very definition of decadence! Truly hard to believe they are grain-free, vegan, gluten-free, oil-free and ready in 20 minutes! *This post contains affiliate links. See my full disclosure policy here. Guess who, the Cookie Monster is back. 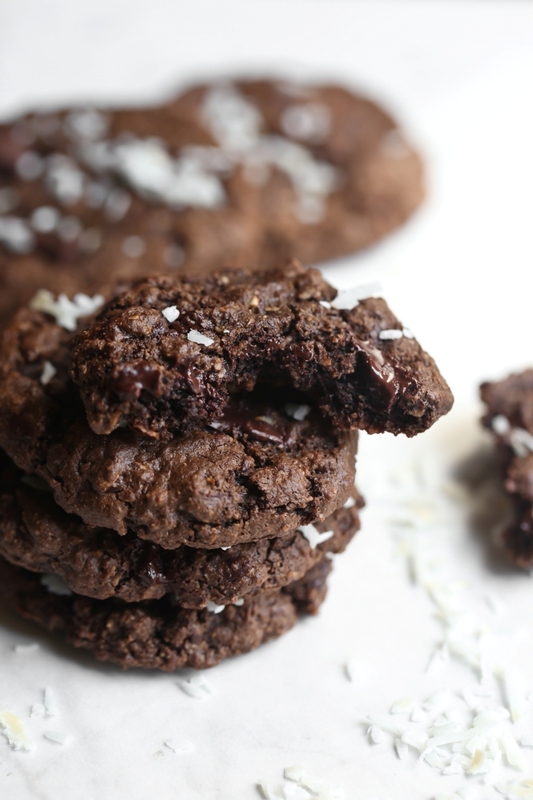 I’m back with grain-free, vegan, gluten-free double chocolate coconut cookies. When you create a cookie recipe that turns out so delicious that you wish you had saved it for your cookbook. That is what happened with these babies right here. I literally winged this recipe a couple of days ago and couldn’t believe I nailed them at the first go! 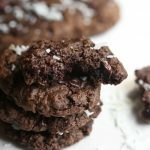 I have been wanting to do a chocolate coconut cookie for a long time and with chocolate chunks and half a bag of coconut calling for me from the pantry, I simply had to answer. These have the perfect amount of chocolate and perfect amount of sweetness and the right amount of coconut. Too much coconut would be overpowering, but there’s just enough to give the flavor and a wonderful chew to the cookies. My daughter even loved these and she doesn’t care for coconut, so please give them a try if you are on the fence about coconut. Because these prove coconut can be delicious and will sway over those coconut-haters, haha! Can we talk about cookie texture here? Crispy edges with chewy, fudgy moist centers guys. I don’t really think anything else needs to be said here. 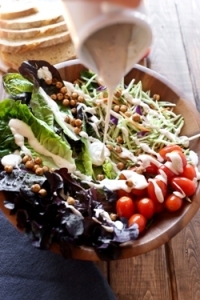 Why grain-free? Well, I’m not grain-free or gluten-free for that matter but I love, love to bake and love to constantly create desserts for all kinds of diets you all follow and many are grain-free and since I’ve been baking with almond flour for years, these were the perfect cookie for my grain-free folks. I’ve been doing the grain-free thing before I even knew it was a thing, lol. 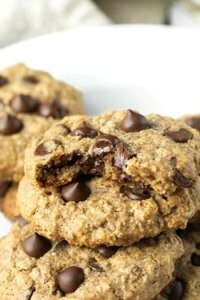 Perfect Vegan Chocolate Chip Cookies. 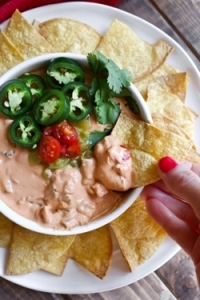 If you make and love these, please leave me a review below and star rate the recipe! These Grain-Free Chocolate Coconut Cookies are 1 bowl, 8 ingredients and everything you want in a cookie. Crispy edges, fudgy and chewy center and the very definition of decadence! Truly hard to believe they are grain-free, vegan, gluten-free, oil-free and ready in 20 minutes! Always use a scale for baking and follow MY weights, this ensures accurate results since we all measure differently with cups. And it is MUCH faster to measure this way since you just use 1 bowl to add to the scale and add all of the ingredients straight from the container, instead of having to get out a bunch of different measuring cups. SO fast and accurate. Preheat an oven to 350°F (177°C) and line 2 sheet pans with parchment paper. (To a large bowl, add almond flour, coconut, cocoa powder, cornstarch, salt and baking soda and whisk well. Pour in the syrup, vanilla and chocolate chunks. Stir well until a very thick, almost stiff batter forms. It will be very sticky. You probably don't want to taste the batter. No, you don't. It will be hard to stop eating it. Use a cookie scoop or form round shapes with 2 tablespoons worth of dough. It will be a little sticky to roll into balls with your hands, but does OR just form the shapes on the pan pressing them down to 1/4 - 1/2 inch thick and smooth the edges into a round shape after dipping your fingertips in water. Place each cookie 2 inches apart. I did 6 at a time on the pan. Bake for 10 minutes. They should have spread nicely and puffed up. I found 10 minutes to be perfect in my oven with crispy edges and a chewy moist center. Your oven may vary, but I would warn to not overbake them too long or it can dry out the centers. Cool on the pan for 10 minutes before moving to cooling rack. Makes 1 dozen. These will soften by the next day, but it's not like they will last that long anyways, who are we kidding. Wow, these look chewy and chocolatey! I’m certainly going to make them. That last photo really does “do you in”. Better watch out, we might have some jealous brownies! Haha, awesome Hannah! Hope you love them! Mmm looks delicious! Thank you for sharing! Do you think tapioca starch can be used instead of corn starch? Hi Mea! Yes, tapioca should work very similarly! Let me know! Finally tried it, and it came out super delicious. I’m tempted to add some natural orange oil just for a variety next time I make these! Thank you!! So awesome to hear Mea, so glad you enjoyed these! Orange sounds amazing! Is it too early in the weekend for this cookie post? Oh heck no!! My son said “it’s the best chocolate chip cookie I’ve ever had!” Well there you have it from a 16 year old’s mouth. Seriously it’s fabulous..a little crunch with a whole lot of fudgee goodness. I could hardly get them into the oven the batter was so addictive. Yay! I’m so so happy you all loved these so much and that your son said they were the BEST he’s ever had! Yay! Do you think dairy free chocolate chips would be cool in place of the chunks? Same weight/measurement. Thanks! I was totally jonesing for a cookie and made them already. So darn good 🙂 I did 1/2c of Every Life mini chips. They didn’t weight out the amount in the recipe but when I poured to the weight it was close to a cup of minis..almost too much so I went with my 1/2 cup measure. They were excellent, will definitely make again. Hi Jennifer!So glad you loved these! Oh yes, I used chocolate chunks from chopped bar so the weight amount would be different if you were using mini chips. So glad they were excellent! I’d be so grateful if you could leave a star rating as well, thank you so much! Made these tonight and so glad I did! Quick & easy and super chocolatey & fudgey. Great with a tall glsss of cold soy milk! So awesome to hear that Dawn! Yay! If you wouldn’t mind giving it a star rating, I would be so grateful! They help me out very much! I forgot to rate it 🙂 fabulous. Thank you so much Jennifer!! Yay Lena! That makes me so happy to hear!! Thank you for the review! Yup, why do you think I’ve been baking for almond flour for almost 6 years, haha! 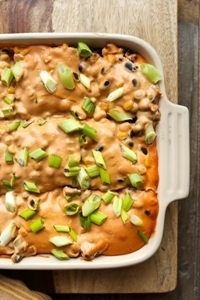 So moist and great for oil-free! I don’t like to use it for everything but it definitely has it’s place in baked goods! Oh yes, the chocolate flavor is off the charts! SO GOOD. I’ve made several batches already and can’t get enough. Chocolate chunks are just so much more gourmet, right?! Thanks Natalie! These are just delicious!!! A friend is gluten free but allergic to almonds. Can you suggest a substitute for almond flour? Awesome! So very happy you loved them!! For your friend, you can try another nut four like hazelnut or grind up raw sunflower kernels into a flour as fine as you can get it and then try that! It will change the flavor and texture some since it will be as fine as almond flour. Weigh it so it weighs the same as the almond flour. Make sure to follow the directions in pressing down and shaping the cookies round for best results. I think this would work, let me know how they turn out! I just ordered the scale you have suggested and have never used one before. Does it come with its own bowl to put the ingredients in, or do you put the ingredients right on the glass? How do you get the correct weight of the ingredients? These look soooo good!! Hi Lisa! No, you use your own bowls or cups. Basically, depending on what the recipe says, add the bowl you are using and then turn the scale on. Once it says zero, add the first ingredient (flour for example) and add it slowly until it reaches the correct gram weight, then hit the right button to zero it back out again (leaving the flour in the bowl) and repeat with each ingredient. It makes it SO much easier doing that then getting out a bunch of measuring cups! Just make sure you hit the button to zero out each time in between each ingredient and pour slowly with liquids or you can accidentally do too much. But using a scale will yield exact results as mine since you are doing the weight and not cups. I use a scale for all of my cooking now, so much faster, especially after you get used to it after the first couple of times. Make sure to still measure with teaspoons though for smaller amounts instead of the scale since anything below a tablespoon tends to be harder for a small kitchen scale to detect accurately. Thank you so much! You explained it so wonderfully! I can’t wait to get started! So so happy you loved them Tamar! Thank you so much for making them! Would you mind giving a star rating? They really help me out, thank you! bake an extra 5 min and they were perfect. A non vegan friend had one and he said that was the best cookie he ever ate! He then ate 3 more LOL. 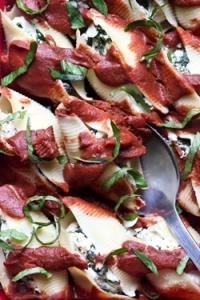 Extremely easy and quick to make and absolutely delicious! That is the best feedback Cathy!! “Best cookie he ever ate!” and not vegan, oh wow that made my day! Thank you for the amazing review! These were excellent! 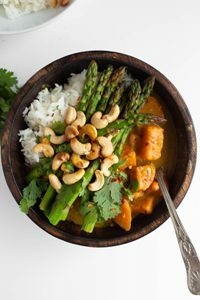 Easy to make and pleased coconut lovers and 2 anti-coconut eaters. I only used 1/3 cup (5TBSP+1tsp) of maple syrup and they were sweet enough for us. They came together in under 5 minutes, and we’re devoured in less time. I think I got 16 using my cookie scooper. These will be a repeat. 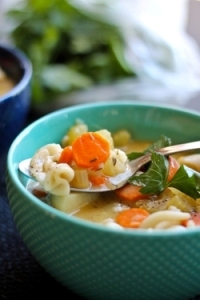 Thanks for another fabulously easy recipe! Yay yay yay! SO so happy to hear Liz! Thank you so much for the amazing review! You weren’t kidding with that warning about tasting the batter 😂 Willow and I decided to make these to bring to my parents for tomorrow…let’s just say I had to make another batch! You can’t make chocolate chip cookies with a six year old and expect willpower. OK, she wasn’t all to blame! The batter alone would make a decadent dessert! Hahahaha!! But baked – omg. Crispy, fudgy, chewy, and oh so chocolate-y!!! These are sooooooo good! We used tapioca instead of cornstarch and since we didn’t have chocolate chunks on hand, we settled for chocolate chips. These will most definitely be added into our cookie rotation!! Can’t wait to share the rest with my family tomorrow! 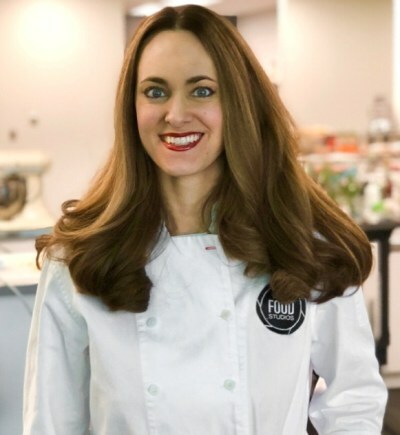 Can I use arrowroot or kuzu instead of cornstarch? Hi Danielle, I haven’t tested that personally so I can’t say the results, but since it’s a small amount, I think it should work fine! Use the same weight amount! I used arrowroot and they came out great!! Hi! These look incredible. I can’t wait to make them. Quick question. I imagine these have a strong coconut taste, no? I have some anti-coconut family members. 😂🙈 Thanks again for this post! Hi Beena! Haha, no they don’t at all actually, which is why I brought that up in the post, haha. I’m actually not a big coconut taste fan and LOVED these. The coconut does more for actual texture purposes giving an amazing chew than coconut flavor. The chocolate does a great job of masking it. Also, you can see one of the reviews above, as well as several I’ve received on social media, have all said it even won over the coconut-haters 🙂 It’s very mild! These look great! Can I use honey or agave instead of maple syrup? Hi Amy! Yes, agave should work fine, I wouldn’t do honey though, it’s way too sweet and super thick and sticky. Thank you for sharing your recipes. Every recipe I tried is amazing! One question which scale you use? Thank you so much Irma! The scale I use is actually linked right above on the recipe highlighted in red “this scale”. Just click on that and you’ll see which one I use! Thank you so much Nicola for the wonderful feedback! So glad to hear you and your little one loved these! This is uncanny—I’ve been craving chocolate cookies but also thinking I don’t use coconut much. Thought about chocolate covered macaroons, but not really into that. 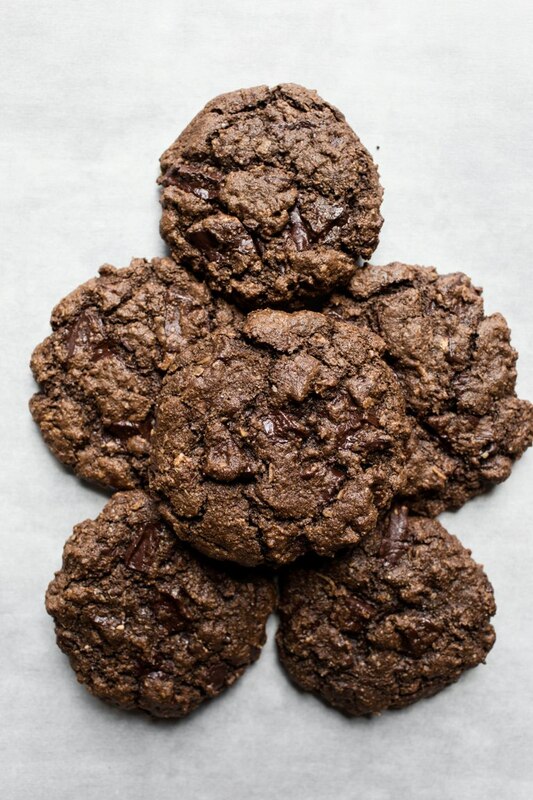 This will definitely be my next cookie! Sometimes in chocolate cookies I’ve added some espresso powder and I think it deepens the flavor, but maybe that would be too much going on so I will definitely make it as is. Hi Ellen! Oooh perfect timing! I think you would love these then! Oh yes, I have done that in many of my chocolate desserts here on the blog and also in the Double Chocolate Fudge Cookies you taste tested for the book, remember those had espresso powder too? 🙂 They just amp up the chocolate flavor without actually making them taste like espresso 🙂 But yes, you are right, these are super chocolatey and rich so they don’t need the espresso powder but it sure wouldn’t hurt either, haha. OMG – this is a dangerous recipe! Simple and quick and I always have these ingredients. I used the tapioca and they turned out perfect. I also added some mint extract because I’ve had a bottle for forever and wanted to try it – so delicious! Haha, yes, they really are sooo dangerous! So darn fast and easy to whip up and unbelievably delicious, they are super dangerous, lol! Thank you so much for making them Rhonda and leaving this wonderful feedback!! And omg, the mint extract addition sounds amazing! So there are these cookies at one of my fave local farm to table restaurant that are amazing and I have been playing with a recipe that replicates them for years (they aren’t vegan just gluten free) because I am obsessed but haven’t gotten around to perfecting it yet. These remind me of them so much! No coconut though, just double chocolaty goodness and they have walnuts in them. My recipe is similar in ingredients, when I first started my obsession I called the place and pretended I had allergies so asked for an ingredient list, HAHAHA. So I am positive these are delicious!! Can’t wait to try them! They sound yummy! 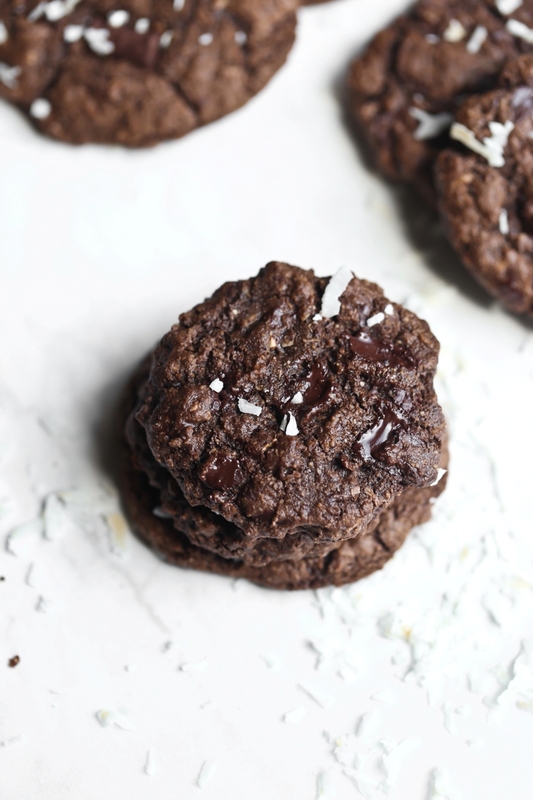 I have never used coconut in cookies before but danggg it adds the most amazing chew and since these are so very chocolatey, it doesn’t leave a coconut flavor, they are just some of the best cookies I’ve ever created! Hilarious that you used the allergy excuse, SMART, lol! Hi Colleen! Oh wow, what a sweet comment! So thrilled your mom loved these so much, you are so sweet to make these for her. Thank you very much for your wonderful feedback, it really is always so wonderful to hear from you!! Another fan here! Although I subbed the maple syrup for coconut syrup and it was a tad too sweet for my palate. (Not too sweet not to eat 4!) Making kid friendly sizes meant I had about 24 little sweet treats. Love!! So happy you loved these Celina! Oh yes, coconut syrup is much sweeter, so that would be why, but still thrilled you loved them! Thank you for making them! Did you use sweetened or unsweetened shredded coconut? I cannot wait to try these! Hi Ashley, unsweetened. I will edit the recipe now! These cookies were so quick and easy to make! They were delicious! Yay! So glad they were delicious, thank you Ashley for the feedback! Another great cookie recipe! 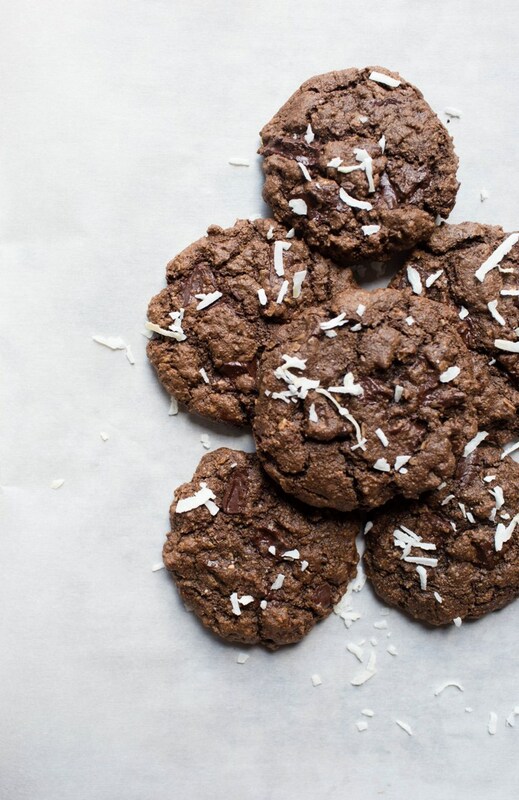 The combination of chocolate and coconut in a cookie that is crunchy on the outside and chewy on the inside. Perfection!! Thank you so much Debbie! SO very happy you loved these! These were as good as I expected. So satisfying and so easy to make. These will be in the regular rotation! I didn’t add espresso powder—didn’t need the flavor deepened. So glad you loved them Ellen, thanks for making them! Oh. my. world. No words can describe how good they are. I’m gonna eat the whole thing. Right. Now. Haha, that is how I feel about them too. So glad you really enjoyed these Sabrina, thank you so much for the awesome review! These jus came out of the oven and oh my…! Eating them with morning coffee on the back porch before it gets too hot. Awesome Diane!! So happy to hear that you loved them so much! What happens when I wake up at 3am and just can’t get back to sleep? I bake cookies. But not just any cookies. I bake these cookies because they are freakin yummy. But do I bake one batch? Oh no. I bake 2 batches. Why? So I can share the pure yummyness. Hi Ari! OH gosh, your comment cracked me up! I’ve sooo been there, so happy to hear how much you loved them, hahaha! Made these with the kids. So quick and easy. Warning double the ingredients because they were so good they went before I could make a cuppa to enjoy one with. Haha, I totally hear that Maria, so glad they were such a hit! Thank you for the review! Hi Roberta! Sugar-free, as in no sweetener at all? The cookies need sweetener or they will taste gross and bitter. Curious what brand of chocolate you use? Anxious to try these! Thanks! A must try! My husband is not a big fan of coconut and is in love for those cookies. He had them all in one day, and we need to bake a second batch!!! Also, I tried with honey, need to add a bit of almond milk to get to the right texture, they turned out great, but you can taste the honey! I also tried them with xilitol + lite coconut milk, mixed together like a syrup, replacing in the same amount the maple syrup (120gr), and it turned out amazing! So, this recipe is mistake proof!! That’s so awesome to hear Tatiana! So happy these were such a big hit!! Yay! So glad to hear they worked out with other subs too, that is wonderful! Thank you so much Monica, so glad you loved them! I just made these and they are so good and very rich. So happy to hear that Tina, thank you so much for the amazing review! These are the most perfect cookies! I’ve made these twice now. The second time was a double batch which I highly recommend-they disappear so quick! I doubled everything except the salt and only used 3/4 tsp baking soda. Delish! And thank you! I’m so happy to hear how much you love them Rona, thank you very much for leaving the feedback, it is so appreciated! These were so delicious, so fast and so easy to make! Two of the cookies never made it to the oven because I couldn’t stop eating the dough. I’m already planning my next (double) batch. I’m so happy you loved them so much Jessica! Haha, I know what you mean about the batter, I was the same way, lol! My family loved these! And the recipe comes together so quickly. Thanks Brandi!! Wow, just made these and they are so delicious! I would love to use this as a dry mix to gift to people. Do you happen to have any ideas for subbing a dry sweetener? Like using coconut sugar in the dry mix and then all that would need to be added is vanilla and possibly a non-dairy milk? So awesome to hear that Sam, thank you so much for the awesome review! Hmm, that is a tough one because the syrup is sticky and thick and what helps to bind and crisp up the edges of the cookies. Milk just won’t work the same and would likely make them soggy. It doesn’t react the same way with baking. You are welcome to experiment, but in my experience liquids like milk don’t fare as well in cookies. I’ll try to work on a cookie mix like that for a post, it’s been on my mind to do for awhile! I’m so glad you loved them Jenny, thank you for making them and letting me know! HOLY COW!!!! Just made 3 dozen of these for our christmas party at work. Simply added a 1/2 tsp of peppermint extract and they were AMAZING!! I had to tell my husband to stop eating them haha. Thank you so much for this recipe!! Awesome Kate! So thrilled to hear this!! Glad they still worked out even with your messups, haha! I arrived on this page after following a link from your No Oil Cooking post and these cookies were just begging to be made. Few ingredients and super quick and easy to prepare. Win-win. They’re exactly as described: crunchy on the outside and soft on the inside. My favorite way to eat them is to freeze them and eat them cold though. I do love hard chocolate chunks in my cookies. I’ve made and tasted a lot of vegan cookies and these are restaurant/deli/artisan quality. I highly recommend them. 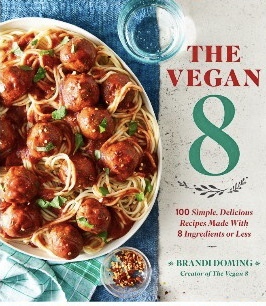 No one will know they’re vegan AND grain-free if you don’t tell them. I did not sub anything, except that I used almond meal instead of almond flour. Some say it’s the same, others say it’s not. Fact is, almond meal is the only thing I can get my hands on in my little corner of the world so this is what I always use. They were easy to roll into a ball after I slightly wet my hands and I baked them for the recommended 10 minutes. Perfect. Yay Estelle! I’m so so happy you made and loved these so much! I love your description (restaurant/deli/artisan quality), that is awesome! Yes, almond meal works fabulous in place of blanched almond flour in cookies, not so much in cakes, but cookies are fine almost always. Thank you so much for being a new reader (from my oil post), so glad to have you and thank you for taking the time to leave a lovely review! These are absolutely the best cookies ever – vegan or non-vegan! 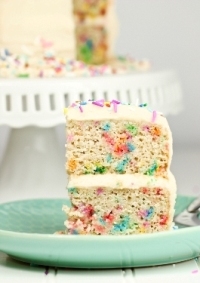 I love baking and that’s something I’ve missed since going WFPBNO but these are awesome! So soft and fudgy on the inside and crisp on the outside! Thank you so much for all your recipes. 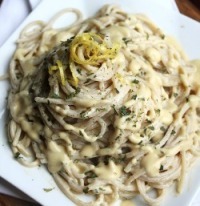 Some WFPBNO recipes are sooo complicated with so many different ingredients but you make it so easy! (And I’m glad you’re also from Texas and shop at HEB). Thanks again! And I gave your cookbook to my sister for her birthday and she loves it! Highly recommend! Yay, thank you Sharon for this AMAZING review! So glad these are the best you’ve ever had, woohoo! Thank you for leaving a review, it means a lot! Outstanding!!! Every single recipe I try of yours, Brandi, is ALWAYS amazing. You are seriously talented. These cookies are phenomenal! Soooo gooey and chocolatey. I always look forward to trying your recipes! You are so kind, Nicole! Thank you so much for the amazing feedback! OMG! Amazing! Better than expected!! These are such a treat!!! So glad you loved them Becca, yay! Oh my GOODNESS!! These are absolutely incredible… I may have eaten three within 30 minutes of them coming out of the oven! Oops! So easy and simple! 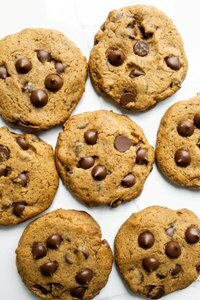 I will definitely be making these one of my regular rotation cookies! Thank you! Wowza ! These cookies are insanely good. 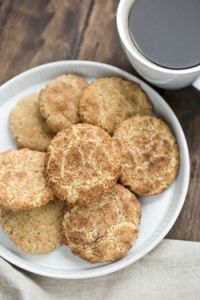 I’m not a big coconut cookie person, and that almost made me pass on this recipe. OMG I’m so glad I made them. They remind me of a chocolate chocolate chip cookie that a local store makes during hatch chili season. Very similar cookie, but with chunks of hatch chili’s and walnuts. I’m looking forward to making these again very very soon ! 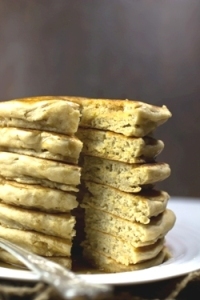 Due to an almond allergy can you substitute almond flour in your fluffy pancakes? Hi, I’m not sure which recipe you are referring to? This post is Cookies, which recipe? I made these for Passover – AMAZINGLY good, and easy! I substituted ground whole almonds instead of almond flour, and used arrowroot instead of cornstarch. SO SO good, taste like brownies! I’m so glad you loved these Gwen, thank you so much for the lovely feedback!